Shop online for 188 bar-mills model trains at discounts up to 25%. Buildings is the most popular of the 6 bar-mills model trains categories, then Roadway, and Scratch Supplies. This is the HO Scale Sidewalk 300 Scale Feet by Bar Mills. This is the N Scale Sidewalk Kit 400 Scale Feet by Bar Mills. 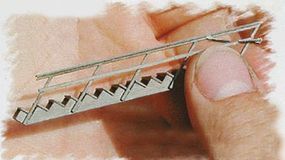 This is the O Scale Sidewalk Kit 100 Scale Feet by Bar Mills. This is the HO Scale Quick Steps Kit pkg(2) by Bar Mills. This is the O Scale Fire Hydrants Unpainted pkg(3) by Bar Mills. 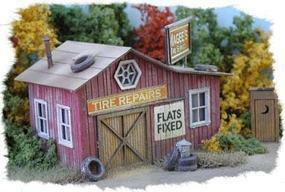 This is the HO Scale Magee's Tire Service Laser-Cut Wood Kit by Bar Mills. This is the N Scale Insta-Fence Kit (Approximately 200 Scale Feet) by Bar Mills. This is the N Scale Wicked Wanda's Kit by Bar Mills. This is the HO Scale Baggage Carts by Bar Mills. Construct "Saulenas' Tavern" with this complete HO scale Craftsman Kit from Bar Mills Scale Model Works. Suitable for both advanced & intermediate modelers. This is the O Scale 55-Gallon Drums w/Closed Tops Unpainted by Bar Mills. This is the HO Scale Shake Style Laser-Cut Shingles - Weathered Gray by Bar Mills. This is the O Scale Crate Assortment Unpainted by Bar Mills. This is the HO Scale The Fishing Shack At Cozy Cove Kit by Bar Mills. This is the HO Scale Wicked Wanda's Kit by Bar Mills. 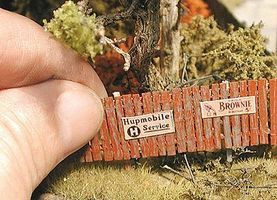 This is the O Scale Insta-Fence Kit Approximately 120 Scale Feet by Bar Mills. This is the N Scale Assorted Crate Stacks Unpainted (2 Large) Groups by Bar Mills. This is the HO Scale Laser-Cut Shingles - Shake Style, Bark Brown by Bar Mills.